Changing the maintop on a Kenmore electric range is not difficult. Kenmore electric ranges will have either an open coil maintop or a Ceran glass maintop. The open coil maintop has the heating element coils visible and is the most common type of electric range. The Ceran glass maintops have the heating coils under the smooth glass maintop. Both maintops remove from the range in the same manner, but the Ceran glass maintop has securing screws in the front of the range. Disconnect the Kenmore range power cord from the wall outlet. You may need to move the range away from the wall to access the power cord. The rear legs connect to an anti-tip bracket in the floor. Push the range toward the wall and tilt the rear of the range up toward you. Slide the range out from the wall enough to access the power cord and wall outlet. Open the oven door and locate the screws under the lip of the maintop that secure the maintop to the range. 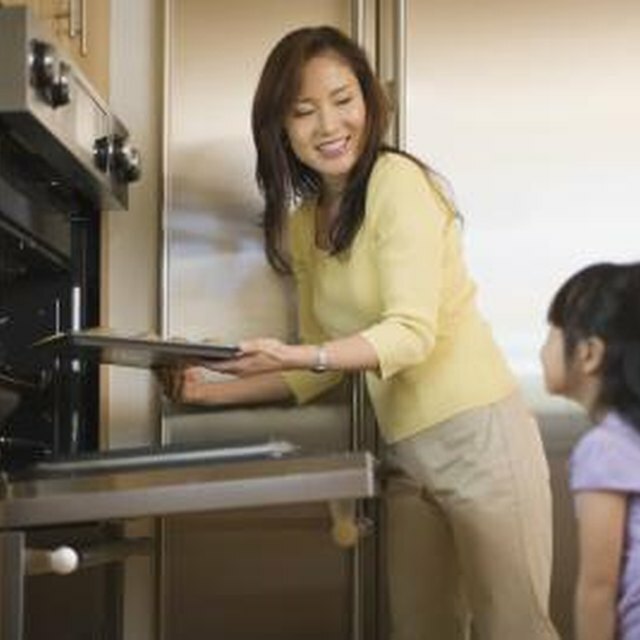 Remove the screws with a Phillips-head screwdriver and close the oven door. Grasp the sides of the maintop and slide the maintop forward until you can see the green ground wire and a bundle of wire in a strap near the rear center of the electric range. Remove the screw that secures the green ground wire to the range with a Phillips-head screwdriver. Remove the screw that secures the wiring harness strap that is next to the ground wire screw with the screwdriver. Slide the maintop off of the range. Unplug the range power cord from the wall outlet. Notice where the coil elements plug into the terminal blocks under the maintop. Lift the coils on the opposite side of the terminal block and pull the coils out of the maintop. Lift the silver drip pans out of the maintop. The drip pans are the pans directly under the heating coils. Locate and remove the screws that secure the terminal blocks to the inside edge of each coil opening on the maintop with a Phillips-head screwdriver. Lift the front of the maintop until you can see both of the side support rods. The support rods hook to the range sides. Unhook the rods by hand and slide the maintop to the left to unhook the right rear hinge pin. Pull the maintop forward until you can see the green ground wire toward the rear center of the range near the control console. Remove the screw securing the green ground wire and the screw securing the wiring strap next to the ground wire with a Phillips-head screwdriver. Pull the maintop off of the Kenmore electric range. Always disconnect power from appliances before attempting repairs.